"Lanakila," this year's collectible ornament designed by Owen Ho, pays tribute to Queen Liliuokalani and her trips aboard the royal train. It can be found at Macy's, the Honolulu City store at Ala Moana and Borders Book Stores at Ward and Waikele. 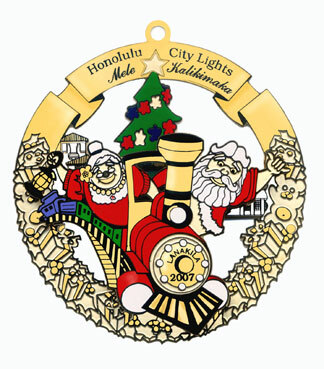 The "Friends of Honolulu City Lights" will also mail any of the eight ornaments from years 2000 to 2007 for $21 (includes shipping and handling). Make check payable to Friends of Honolulu City Lights and mail to: P.O. Box 8877, Honolulu, HI 96830. Spectators visiting Honolulu City Lights this year will be in for a special treat. A new 40-foot train carrying two menehune will wrap around the stately Christmas tree in front of Honolulu Hale. "In the past, we strictly made standing sculptures," said sculptor Alex Ching. "This year, the train shoots smoke from its pineapple smokestack and there is a blinking light on the front of the engine." Time: 6 p.m., with Mayor Mufi Hannemann and first lady Gail Mukaihata Hannemann officiating and the Public Workers Electric Light Parade to follow. The parade features more than 2,000 marchers, 40 vehicles, 15 floats and 15 bands and begins at Aala Park, travels down King Street and ends between Punchbowl and South streets. Note: Food booths and keiki rides begin at 4 p.m. at Skygate; a holiday music concert begins at 5 p.m.; the Christmas trees and wreaths will be on display from 6:30 to 11:30 p.m.; and Santa will be available for photos from 7:30 to 9 p.m.
One menehune drives the engine and the other is on a flat car, hanging on to a Christmas tree. The large sculpture was started in September and was finished just before Thanksgiving, Ching explained. The piece was constructed using a lumber framework, Styrofoam, concrete mixed with adhesive and a fiberglass mesh to hold everything together. Ching is the third sculptor to contribute his work to the annual seasonal display, following predecessors Kurt Nelson and Mike Smith. As a city and county recreation specialist who handles training and arts and crafts programs, he began helping and learning how to create these oversized sculptures, which is now included in his job description. After his hard work is finished, and everything is set up and ready to go, Ching likes to make visits to the display. "It's nice to go down and see it, to be there anonymously," he said. "I like to check out people's reactions and hear their comments."